This snarling, canine beast pads forward on all fours, its slender front limbs looking more like hands than a wolf's paws. Prepare to become dinner! This is a breakout SoundSet from the Pathfinder Adventure Path SoundPack. 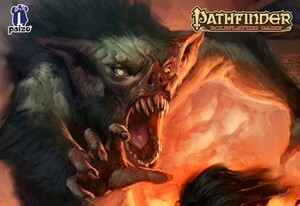 Barghest Battle SoundSet © 2014 Paizo Inc. Paizo Inc., the Paizo golem logo, Pathfinder, and Pathfinder Adventure Path are trademarks of Paizo Inc. Sounds created under license with Paizo Inc.